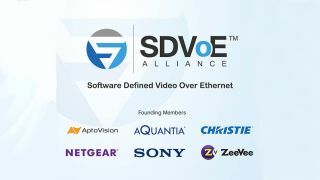 AptoVision, Aquantia, Christie Digital, NETGEAR, Sony, and ZeeVee have founded the Software Defined Video Over Ethernet (SDVoE) Alliance to standardize the adoption of ethernet to transport AV signals in professional AV environments, and to create an ecosystem around SDVoE technology that allows software to define AV applications. All AV distribution and processing applications that demand zero-latency, un-compromised video can benefit from SDVoE technology, which provides an end-to-end hardware and software platform for AV extension, switching, processing, and control through advanced chipset technology, common control APIs, and interoperability. SDVoE network architectures are based on off-the-shelf ethernet switches, thus offering substantial cost savings and greater system flexibility and scalability over traditional approaches such as point-to-point extension and circuit-based AV matrix switching. SDVoE Alliance founding members bring different perspectives to the SDVoE initiative, spanning the entire ecosystem with expertise in chipsets (AptoVision, Aquantia), switches and storage (NETGEAR), and AV endpoints (Christie Digital, Sony, and ZeeVee). The SDVoE Alliance already benefits from more than 35 shipping products and numerous installations in healthcare, enterprise, entertainment, hospitality, retail, houses of worship, government, military, industry, and security. Bring awareness to new opportunities by educating the industry and offering training in the new paradigm. At ISE 2017 (Amsterdam, February 7-10) on stand 12-H55, the SDVoE Alliance will feature a series of demonstrations highlighting that only SDVoE technology delivers: a full stack solution for AV over IP, zero-latency 4K60 over standard ethernet, a complete application development platform, powerful AV processing with simple controls, and 4K60 with HDR. Free training sessions on deploying zero-latency AV-over-IP systems using SDVoE technology will be held Wednesday, February 8 at 12:30, 2:00, or 4:30 p.m. in room F002. All AV system integrators, designers, consultants, installers, and manufacturers are invited to register to attend at sdvoe.org.